If you’re currently figuring out how to handle the burden of college tuition, chances are that you may be feeling overwhelmed. The good news for New Hampshire residents is that you may be eligible for financial aid opportunities to lessen your load and cut back on the cost of college. Tuition assistance exists on all different levels, from government scholarship and grant programs, to aid administered by local and private organizations. Depending on your personal financial situation, high school credentials, and other characteristics, you may be eligible for one or more types of financial aid. To find out what types of financial aid are best suited for your situation, let’s take a look at the four steps all New Hampshire residents should take towards funding their college education. Your first task in securing financial aid is to fill out the FAFSA. This stands for the Free Application for Federal Student Aid, and it’s a form is used to determine your eligibility for financial aid. Because the FAFSA is used throughout the country, it’s required for most financial aid applications—even those not administered by the federal government. Additionally, you’re going to want to fill it out sooner rather than later so that you don’t miss out on scholarships and grants with early deadlines. If you experience trouble with the FAFSA, don’t hesitate to seek help! You can check out our free and helpful guide to answer questions you may have about the process. Now that you have completed your FAFSA, it’s time to apply for additional state-funded aid. A bonus for New Hampshire residents is that you can qualify for aid administered by the New England Board of Higher Education (NEBHE), which is open to all New England residents. NEBHE offers a program called Tuition Break for eligible New England students who want to attend school in a different New England state. The program offers regional tuition costs, which are lower rates than standard out-of-state tuition. It also helps students transition from community colleges into four-year institutions. Scholarships and grants specific to New Hampshire residents are also available. Scholarships for Orphans of Veterans for New Hampshire residents with a deceased parent as a result of their participation in the military. Statewide Student Aid Program for New Hampshire students between the ages of 17 and 23 who are pursuing a four-year degree program. Career Aid for Technical Students for New Hampshire students between the ages of 17 and 23 who plan to attend a two-year college or short-term training program. Medallion Program for New Hampshire students pursuing short-term technical or vocational study in an eligible field. Adult Student Aid Program for older New Hampshire students (typically 24 or older) pursuing an undergraduate degree or revisiting education. Many of these awards are administered by the New Hampshire Charitable Foundation. This is the largest provider of publicly available scholarships in New Hampshire, and you can find more information about the foundation’s scholarship listings here. Meeting with your high school guidance counselor can help you find grant and scholarship dollars as well. Your guidance counselor can update you on local scholarship listings and direct you to the application websites. You might want to set a reminder in your phone so that you remember to schedule an appointment. You should also do some research on your own. Visit sites like CollegeScholarships.com to search for grants and scholarships offered in your area. 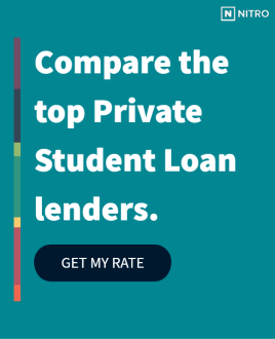 If you’ve tried the previous three steps and are still in need of more funding, a private loan could top off the funds you need to pay for your college education. Use our free NitroScore tool to help you figure out how much you need to borrow, and to see how easy or hard it will be to pay off your loan after graduation. A college education shouldn’t be out of reach for New Hampshire residents. Start planning for your future today. See our recommendations for the best banks for a private student loans.